In 1793, Princess Louise of Mecklenburg-Strelitz (1776-1810) married the Prussian crown prince and future king, Frederick William III (r. 1797-1840). Following Prussia’s disastrous defeat by Napoleon at the battles of Jena and Auerstedt in 1806, she and her family fled to East Prussia. From there, Louise made personal appeals to the French emperor in an attempt to soften the consequences of the Prussian defeat. Napoleon’s correspondence with his wife, Josephine, suggests that he found the Prussian queen perfectly charming, but her efforts left him unmoved. The Peace of Tilsit (1807) ultimately stipulated losses amounting to nearly half of Prussia’s territory (including land annexed in the final two partitions of Poland). Louise’s patriotic efforts and her unpretentious charm brought her soaring popularity. She was the first female member of Germany’s ruling class to become an object of nationalist enthusiasm, albeit of the monarchist variety. 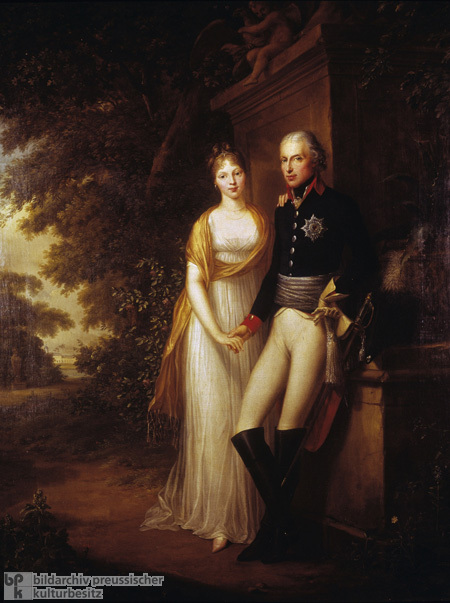 This painting shows Louise and Frederick William III in the park of Charlottenburg Palace in Berlin. Louise is dressed in an Empire-style gown; the couple’s casual pose is suggestive of domestic tranquility. Oil on canvas by Friedrich Georg Weitsch (1758-1828), 1799.